Maddy Stegbauer shoots a free throw in the fourth quarter vs. Hillsboro – her final shot as a MHS senior. GREENFIELD — There are times when the game is just a game and life takes over. That is the case for McClain senior Maddy Stegbauer, who during the early stages of the basketball season suffered a season-ending knee injury and now is on the road to recovery to eventually jumpstart her basketball career once again at the collegiate level. With Stegbauer, even through all of the tragedy of tearing her ACL, she has stayed strong for her teammates, family and herself with the senior not missing games and doing whatever she has to do to make herself and her team stronger. The injury occurred during a Saturday home game at McClain Gym — the fifth game of the season — against the Huntington Lady Huntsmen in the early stages of the second half. The play was just a normal play when out of nowhere, Stegbauer was lying on the court in pain, grabbing her knee, as the entire gym went silent. Stegbauer eventually got to her feet, and with the help of athletic trainer Karl Knutsson and her sister and sophomore teammate Emma, Stegbauer made her way to the bench area, fighting through the tears caused by the injury. Fast-forward to another Saturday afternoon game — the final Saturday afternoon of the regular season for the 13-win Lady Tigers, on Feb. 9. Stegbauer and four of her senior teammates were honored before the game, and not only that, but the group of five took a trip back in time with all five seniors being placed in the starting lineup one last time. 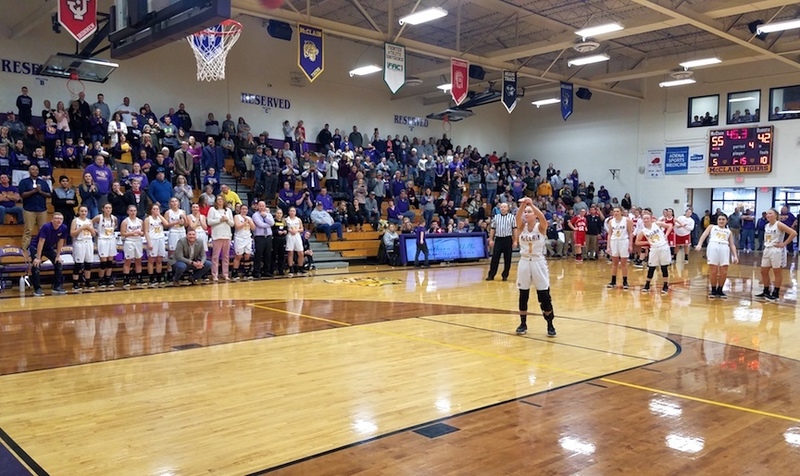 Senior teammate Bryn Karnes knocked the opening tip-off to Stegbauer, and well, that is when — for the first of two times — a rivalry game between the Lady Tigers and the Hillsboro Lady Indians became about just a little bit more than basketball. 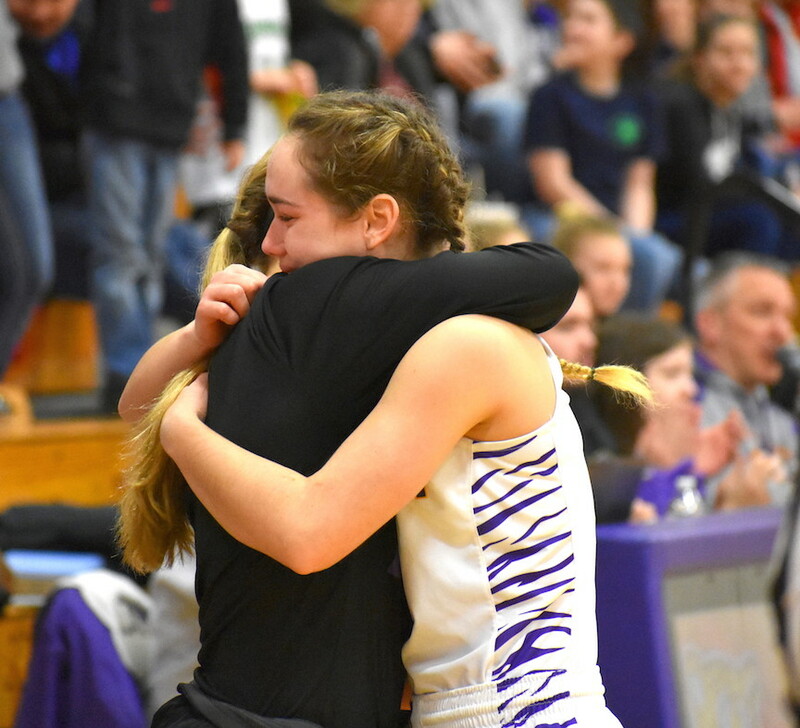 Once Stegbauer gained possession of the basketball, Stegbauer fought back some tears, dribbled the basketball over to her sister on the bench and passed the torch (or basketball) to Emma, giving her a hug to a standing ovation from both fan bases. The entire moment was a bit of a surprise for Stegbauer, who didn’t know anything like that would occur until the previous day, and even more, the senior didn’t know there was more in store for her. The scene was much different from the one a couple months earlier when the injury occurred on the same court, and unbeknownst to Stegbauer – and everyone else in the gym – that wasn’t going to be the final time she would play on her home court. With the game in favor of the host Lady Tigers during the fourth quarter, Hillsboro head coach JR Moberly “asked for a technical” from the official. To the surprise of many – including Stegbauer – that allowed her to have two final shots at McClain Gym. Those two free-throw attempts were just inches away from where her injury occurred in December. “I wish I could’ve given her a little heads-up so she could practice and be ready,” Moberly said of the moment. “That’s tough to get off of the bench and try to shoot like that. She’s had such a great career (at McClain). McClain head coach Jarrod Haines spoke very highly of Moberly and the opportunity given to Stegbauer late in the fourth quarter. Though the shots were some of the first that Stegbauer has taken in a couple months as she continues her rehab, it was the bow on top of a high school career that included many points scored, exciting wins, tough losses and a purpose that made Stegbauer a true leader on and off the court. “It’s been tough,” Stegbauer said of not being able to finish her senior season. “But my family and friends have helped me through it, and God, especially. Haines spoke about how the rehab process has gone for Stegbauer this season, as there has been a lot of hard work put in behind the scenes by Stegbauer that many don’t see. Haines also agreed with Stegbauer — who has over 500 points in her career — saying that all the work she’s putting in for her rehab and overcoming adversity will make her a better person. “She knows it’s going to make her a better person and a better basketball player. It’s not what anyone expected. She had to shift gears from being a player to being a coach,” Haines said. “We’ve asked opinions from her and tried to ask her to address the team sometimes. This senior season has been an unexpected one for Stegbauer. Before she was injured, Stegbauer opened the season with nine points against Westfall. She scored 17 points against Zane Trace in their second game, then less than 24 hours later came back with a 12-point effort in a win against Jackson. Her most memorable game of not just this season on the court, but overall, was against Miami Trace. That game, in which Stegbauer scored 17 points, was played on Dec. 5, where the Lady Tigers gained a big Frontier Athletic Conference victory over Miami Trace by a 37-35 score, moving McClain to a 4-0 record at the time. As that game played out, it was Stegbauer who took over with a layup off a long inbounds pass from sophomore teammate Jaelyn Pitzer for a then-three-point lead. Stegbauer later helped give MHS a four-point advantage with under 20 seconds left in the game by making a free throw. “(The Miami Trace win) was probably my favorite moment. That, and the game (Saturday). That was great,” Stegbauer said. The Lady Tigers have worn those shirts in warmups since they were given them, honoring their teammate. Maybe the most special part of playing at McClain for Stegbauer has been getting to play with her younger sister Emma and just continuing to be a part of the team. “Playing with my sister is a special opportunity that not everybody gets to have. I may not have had all of this year, but it was still just as special to me,” she said. “It was a great experience being able to play for the time that I did. Great article, Steve. You made an awful lot of people happy. Maddy is special and a great young lady. I agree that Coach Moberly is a special man and coach. Thanks, Coach Moberly, from all of the Tiger fans. This comment has been hidden due to low approval. As I told JR Moberly today, "Your Dad is proud of you." Of course, Glenn Moberly (a Lynchburg-Clay Hall of Fame Coach and AD, smiling down from Heaven), probably would have teased his son that "We don't have to ask for technicals, we get enough as it is." Great story, Stephen. This is what it's all about. - RR This comment has been hidden due to low approval. I greatly enjoyed watching Maddy play during her four years at MHS. She never displayed a bad attitude, and you could tell she poured her heart and soul into every game. I was at the Huntington game and was so sorry to see that unfortunate injury. Congratulations to Maddy on all her many accomplishments. This comment has been hidden due to low approval.